Home » Main Menu » News » Sun Sap release ‘Time Enough for Love’. Sun Sap release ‘Time Enough for Love’. Sun Sap are a credit to the Indie Rock/Pop genre. Just listen to that guitar! Vocally sound with lyrics with deep meaning. To be truly happy we should take all chances we get to love and be loved. Musically there is too many instruments to name and I love that!. Sun Sap are a band to watch in 2018 and beyond. 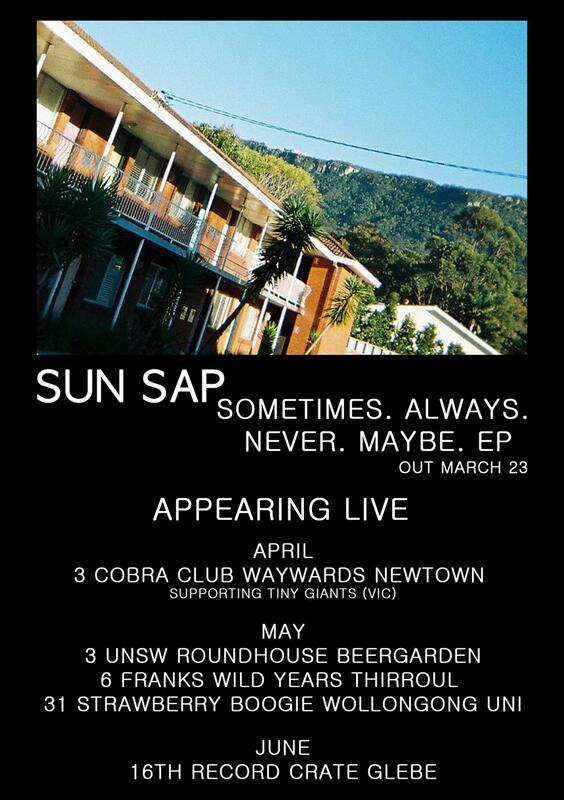 Following the release of their scorching summer anthem “Walking Out The Door“ and soul-warming “Miss Behind”, the “Leisure Coasts” favourite garage-rockers Sun Sap are proud to be unveil their debut EP Sometimes, Always, Never, Maybe out Friday, March 23. Showcasing the sextets trademark surf-soul vibes, sun-soaked guitars and intoxicating swagger, Sometimes, Always, Never, Maybe is just what the doctor ordered, so get ready to take a big swig! With half the members residing on NSW’s South Coast and the other half in Sydney, the band (consisting of drummer Shaun Gaida, vocalist Adam McTaggart, guitarists Evan Rotherham and Rob McCauley, vocalist and percussionist Bec Chandler and bassist Aaron Diaz) come together effortlessly on this glorious five-track offering. A project formed out of demos they’d written while abroad, Sometimes, Always, Never, Maybe employs a dynamic mix of instrumentation; from piano to celeste, horns and strings, various percussion elements, a Mellotron and even a hundred-year-old harmonium. Recorded in Gaida’s home studio, and featuring horn work from members of Kava Kings and Yetti Calzone, the EP steers away from your run-of-the-mill rock arrangements, and encapsulates the grittiness and energy of the band’s unrivalled live performances. Keeping a busy live schedule in 2017, Sun Sap toured extensively in support of The Orwells (USA), Guantanamo Baywatch (USA), Polish Club and Hockey Dad, as well as performing at Yours and Owls and Bad Friday. With a seemingly endless supply of hits under their belt, from the radio-championed “Love Is Gone” and “Hanging Hearts”, plus video additions to Rage – the band are now thrilled to unleash their debut EP. Sonically drawing inspiration from the jangling pop melodies of The Kinks, The Beatles, Dandy Warholsand The Brian Jonestown Massacre, Sun Sap have carved out a sprawling, raw exploration into 60s rock n roll, with tones of sharp clarity to ensure a contemporary edge and a serious amount of punch. Don’t miss your chance to catch Sun Sap as they hit the road this April / May – exhibiting their roaring live performances and invigorating stage presence to their ever-growing fan base.